The new Optiganally Yours album “O.Y. In Hi-Fi” is out as a stand-alone release this Friday, July 20th! Recently we collaborated on a custom Orchestron disc for the synth pop duo Reed & Caroline. They sent over some of Caroline’s vocal textures and we turned them into an exclusive disc called “Caroline.” Sorry- this is a private title and not available for purchase! You can hear the Caroline disc as well as other standard Orchestron discs on several songs from their new album “Hello Science,” on Vince Clarke’s Very Records label. If you look closely at the album’s cover art, our disc is used as part of the graphic design. We also got a nice shout-out in this review of the album. R&C are also currently opening for Erasure on the US leg of their tour, though the Orchestron was deemed too bulky and fragile to take out on the road! Here’s a photo of Reed & Vince inspecting the Caroline disc. VINCE CLARKE & REED HAYS – An introduction to the Vako Orchestron from VeryRecords on Vimeo. Announcing: Optiganally Yours – ‘O.Y. In Hi-Fi’, for the masses! O.Y. In Hi-Fi will be released July 20 on split-color “ketchup & mustard” vinyl, yellow vinyl, and digital. Also, here’s the new single from the album! The first track from the new Optiganally Yours album “O.Y. in Hi-Fi” has been released! Optiganally Yours started in the mid 90s when one of Rob’s housemates, Pea Hix, got obsessed with the Optigan. 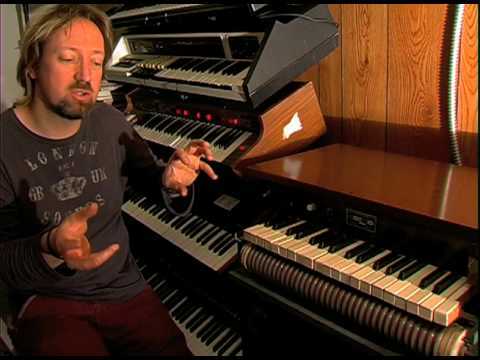 This was a chord organ made by Mattel in the early 70s that played back lo-if sound loops on LP-sized discs. Think of it as the 70s version of GarageBand. When Pea had the idea to start a band around these haunting sounds, Rob chimed in and said “I’ll be the singer, and the band will be called Optiganally Yours.” Two albums were released in the late 90s (“Spotlight on Optiganally Yours” and “Optiganally Yours Presents: Exclusively Talentmaker”), with work beginning on a third. This album was to be called “O.Y. In Hi-Fi” because Pea had acquired the original studio master tapes which held all of the sounds recorded for the Optigan discs, and was assembling the basic tracks from thousands of loops and samples from these tapes. These sounds were all hi-fi studio quality, in contrast to the grainy, lo-fi sound of the Optigan discs. For a variety of reasons, the project proceeded in fits and starts, never quite gaining the momentum it needed to get finished, despite the quality of the songs. Some of the songs made it into the live set, but most of the rest have remained unheard for many years. Periodically the songs have been updated and re-recorded, such that very little remains of the original recordings made all those years ago. Now, with the release of Rob’s box set on Joyful Noise, the timing seems perfect to finally bring this collection of songs into the light! For a very limited one-month time period only, from now until March 25th 2018, we’re offering an opportunity to buy discs from our back-catalog (click this link to go to the web store). Normally we’re not able to keep these titles in stock, because historically the vendor that makes the raw discs has required a minimum order of 25 copies of any given title. Since our cost for these copies is quite high, and it’s an extremely niche market, we can’t afford to buy them in large quantities and remain thousands of dollars in the red while the orders slowly trickle in. BUT, over the course of a year we typically reach a point where there are enough total requests for discs across all the various titles that the vendor is willing to take an order without requiring the usual minimum number of copies for each title. This all has to happen in one fell swoop, so we’re limiting the time frame in which folks can place their orders. Once the deadline passes, we’ll order only as many copies as we have actual orders for. It will then take a month or two to get all those copies fabricated and sent out. Your patience is appreciated! Unfortunately, we cannot offer any sort of bulk discounts or other types of custom orders beyond what is offered in our store. In the past we’ve experimented with different bundle pricing schemes, etc, so the prices set for those bundles will remain in effect. All discs will ship with the printed jackets exactly as pictured on the product page for each item. Mellotrons and Optigans and Space Echoes, oh my! A collision of nostalgic tones and deconstructionist sensibilities, Cranky Machines is a wobbly, glitchy, stuttering set of 13 originals inspired by funky throwback styles and charismatic antiquated musical technologies. Meticulous yet lighthearted, decadent yet minimalist, analog yet digital but also a bit optical—this sophomore album by pianist/harmonicist/producer Ross Garren and looping specialist/guitarist Andre LaFosse is an unapologetic and fashionably passé labor of love by two kindred idiosyncratic musical spirits. If anyone is interested in becoming the queen or king of Optigans in Tennessee, I know where FIVE machines are sitting. Don’t come back to me when they ruin your life forever – it’s your choice to deal with the devil! Just click on Brian’s name above to send him an email! !